= Mainichi hitotsu hitotsu tsumikasane desu. = You need to build things up one by one everyday. Hi, everybody! First, we have an announcement to make! Maggie and Yukari have just started a fun page on Facebook! Hope you all visit us there! OK, this lesson is for my dear Twitter followers who have been studying with us. I have also been giving my followers a weekly quiz every Sunday. So if you want to try, please follow me on Twitter. This is my third review lesson for all the Super Basic Words. This lesson will cover the last 12 weeks. That means you will learn a lot! I hope this is useful for people who are not doing Twitter as well. If you are a beginner, you can learn just the main words in romaji or hiragana. If you are more advanced, try learning the kanji along with the examples. I made all the sound files so that you can click the audio buttons and listen to the pronunciation as well. They are all random so you can start from any week. 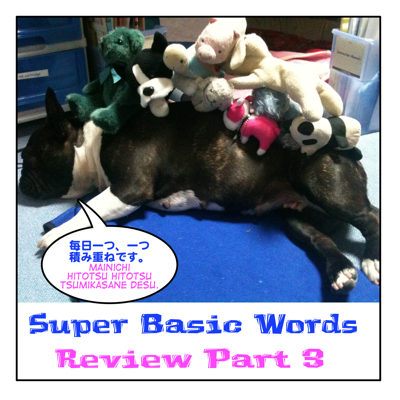 Be sure to check, Super Basic Words review Part 1, Super Basic Words Review Part 2 ,too! = Ahhh.. I piled them up too much. My back is so heavy…. Thank you for the comment. Please come back!! Also seems like you have a nice blog,too!! Sensei I want you to check this sentence please! waah I’m glad that I didn’t make a mistake. thanks to you I’m getting better! That’s because you have been studying hard! Hi, Jetta! こちらこそ！Thank you for checking the lesson!